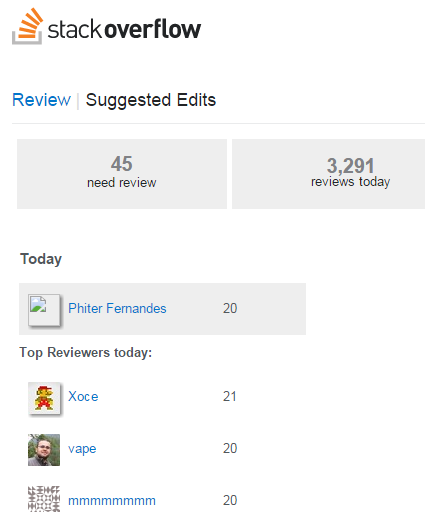 So I was reviewing today and I've noticed that some guy has reviewed 21 times, when the maximum is 20 a day. Is it a bug? Or can I review above the limit in a day? Here is the url for the review page. This user approved an edit to their own post, which is always allowed. They also did 20 reviews, taking them over the 20 review limit. Not the answer you're looking for? Browse other questions tagged discussion bug review . How can someone review more than 20 items in a day? Another possible loophole in the audit system? How many posts can a user review per day? Triage Reviewing: Question Display Is Incorrect?